Using a sharp knife, score skin of Open Prairie Natural Pork shoulder, taking care not to cut into flesh, with lines running the length of the shoulder spaced 1 inch apart. Rub Cajun seasoning and salt, if using, evenly all over pork. Place pork, skin side down, in large Dutch oven or covered casserole and pour beer around pork. Bring beer to boil over high heat. Cover tightly and bake for 2 hours. Turn pork over, putting any skin that sticks to bottom of pot back on top of roast. Roast, uncovered, until pork is fork-tender, 1 1/2 to 2 hours more. Remove from oven. Let stand, covered, for 30 to 60 minutes. In small bowl whisk vinegar, ketchup and hot sauce. Transfer pork to chopping board. Pour off pan juices into glass bowl; let stand. Using a knife, cut meat off bone. Using two forks, pull pork into shreds or chop with knife, discarding fat and rind as desired. Transfer to a large bowl. Skim off and discard yellow fat in pan juices, and stir juices into pork. 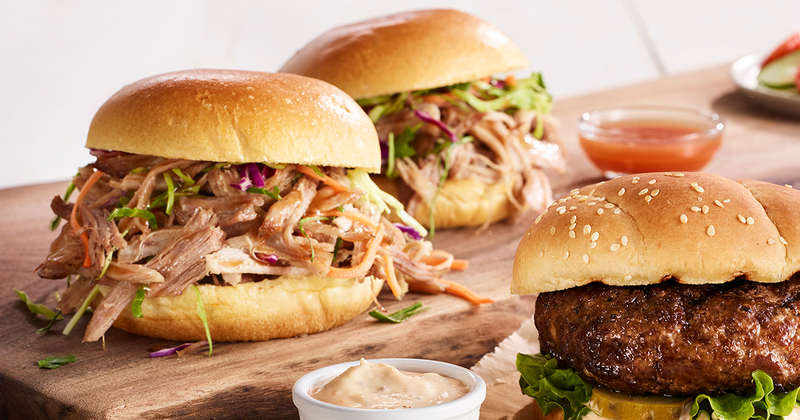 Serve pork on buns with sauce on the side for drizzling on the pork. Serving Suggestions: Pulled pork is even better with coleslaw, served on the side or spooned onto each sandwich. Beverage: Serve with a cold lager beer.